-- Please Select --Width - 1 1/4"Width - 1 1/2"
High Noon Holster’s Embossed Rock Steady line of belts are designed to carry the weight of a handgun at the same time they are built for comfort and action. The belts are individually handmade and are constructed from two pieces of top-quality, premium grade leather with a reinforcement in the middle of it. This reinforcement is sewn and laminated in between the two pieces of leather which gives the belt excellent rigidity and provides maximum support for any combination of weapons and accessories. 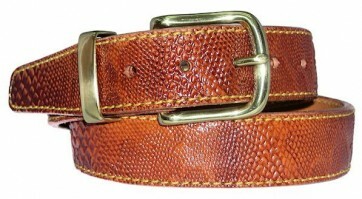 A belt manufactured in this way is much stronger than just one or even two pieces of leather. The reinforcing layer also increases the life of the belt because it prevents it from stretching, rolling out, and sagging. High Noon Holsters was the first in the industry to reinforce gun belts with a synthetic insert.